I was lucky enough to be asked to review the Gardeco Altiplano Mexican Art Chiminea from Chimineashop.co.uk (wwww.chimineashop.co.uk), they kindly sent me the chiminea for my review but as always, all opinions, images and words are my own. I used to own a chiminea some years ago before I moved to Leicester. 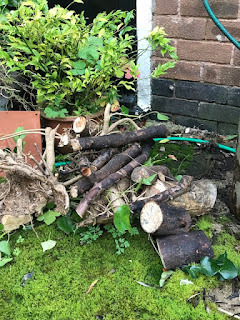 I loved my chiminea, I used it fairly often and looked after it carefully...... until the day I knocked it off its stand and broke it. I cursed myself and decided one day I would replace it. Well years pass as they do, but in the back of my mind I knew I wanted to own one again. Earlier this year I started looking at them more seriously again, but I was struggling to make up my mind. I had realised that Gardeco had probably the best and widest range of different types of chiminea, but this made choosing just harder. Then, as if the gods of the chiminea were watching me, I was asked if I wanted to review one for my blog. I could not believe my luck! It still took me a while to decide which one though, but in the end I went for the Mexican Art chiminea. 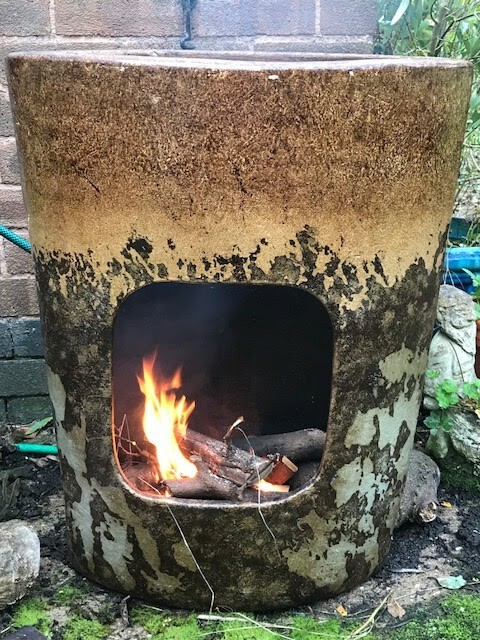 It was quite different from my original chiminea, which was more what I would call traditional in style, but it really caught my eye and I knew it was the one for me. The chiminea arrived quickly and well packaged. I could not decide where I wanted it to live to begin with, so I put it into a holding position until I decided. I also covered it with a bin liner, rather undignified I know but I wanted to look after it properly and getting too wet was not going to be a good thing. I need to add a word of advice about when you cover this kind of chiminea. You need to place something to hold the cover in place. Because this chiminea has a large open top if you just pop something over it like I have above; the moment it rains the rain collects on the top until the weight makes the bag fall inside of the chiminea. It took me a while to work out what was happening with this. I realised quite quickly where I wanted the chiminea to live and so I moved it into the Courtyard. I also bought some chiminea stones to place in the bottom of the chiminea as they help protect the bottom from getting too hot. I also bought a proper cover for it. I want to look after it properly and this means taking some care. Yes the tile is to prevent the rain from forcing the cover to fall into the chiminea. The cover should also protect it when it starts to get colder. 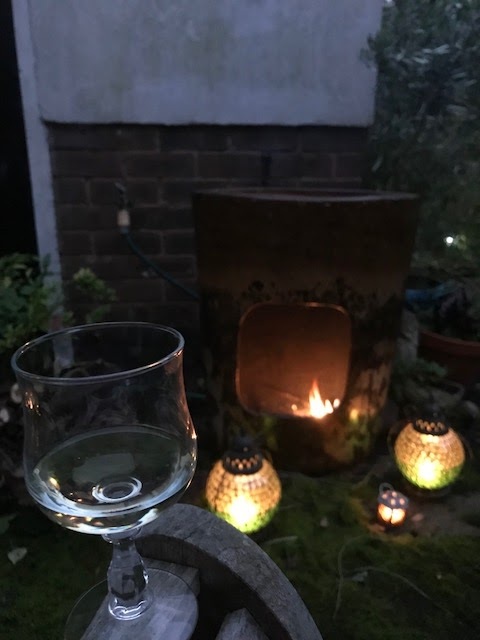 The nights have started to draw in and this makes the chiminea the perfect way to spend the late afternoon, early evening. Despite lots of rain recently we finally had an evening when it was fine and not due to rain. So the chiminea was duly lit. I cannot tell you how happy this made me. I lit mine using kindling and a firelighter. 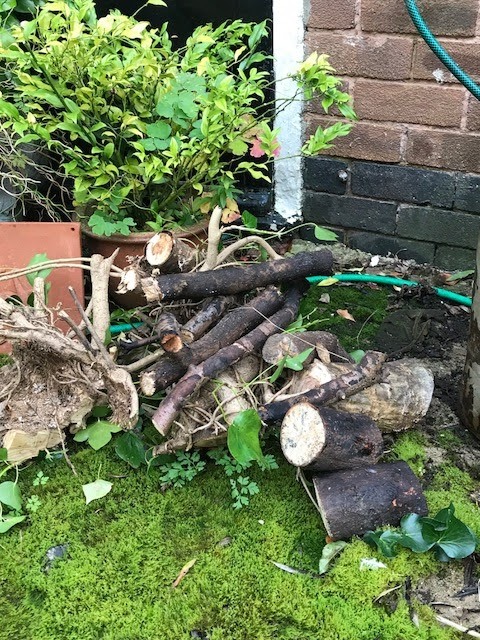 I have quite a lot of small logs/branches to burn at the moment as autumn is the perfect time to be pruning and cutting back the various trees the surround the garden. The ones I have been using have been cut for quite a while which means they are quite dry and not sappy. As dusk began I put some lights around the chiminea. 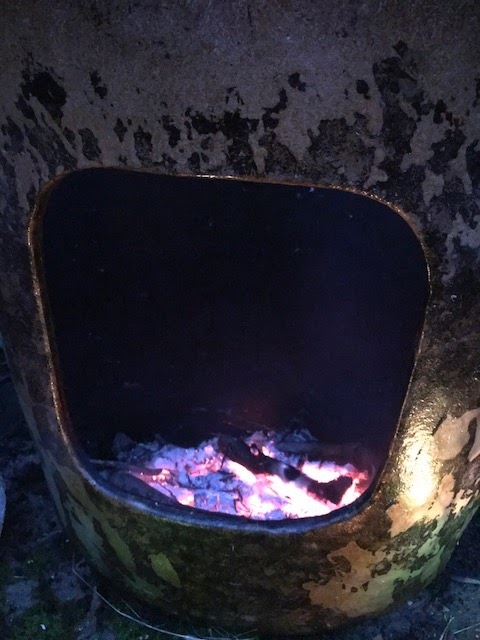 The heat started to work up the body of the chiminea which meant I did not need to keep it blazing, it was radiating heat quite nicely. I worked out quickly that I did not need to build a big fire inside the chiminea; as the fire starts to settle it gives out a good amount of heat. Safety does matter with a chiminea, they need to be somewhere stable and level and you have to take care what you burn in them. As you might expect, reading the instructions is generally and specifically a good idea. I sipped a small sherry as I sat there, just loving the moment and enjoying being outside for that little bit longer. I also added some lavender prunings to the fire. This releases a wonderful aroma. The chiminea is a total delight, it is very well made and a thing of beauty. I am going to make sure it does not get too frozen in the winter by bringing it under cover. I can see that I will be using this chiminea for many years to come. Love the idea of being able to sit outdoors, keeping warm and watching the flames - a very serendipitous opportunity to review something! Thanks- yes I was incredibly lucky to be asked. It is nice to cosy up in front of - it’s going to get used a lot.